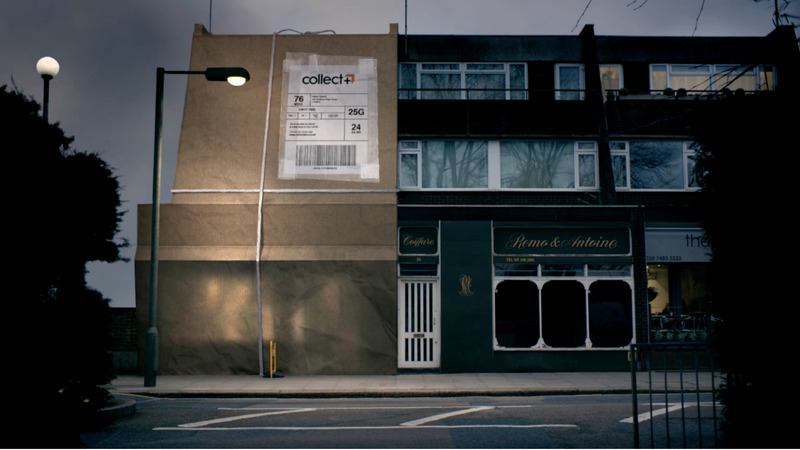 Mill+ Creative Director Dan Williams, worked alongside Dawson Pickering to create the 30" launch film 'Wraparound' for Collect+, the largest store-based parcel service in the UK. The spot brings to life the unique Collect+ user experience, which is designed to fit around everyday life, making a smoother process by which to send, collect and return parcels from many local stores and petrol stations - in the form of buildings across the country being packaged, taped and stamped. This spot has a deliberately soft and slow moving pace - however the shoot that went into it was quite different. Shot in just one day, the production adopted a "run and gun" style approach to filming. Shot with a small crew and the sole use of a slider and a tripod gave the team the ability to cover 11 locations in 9 hours, truly capturing the nationwide reach of Collect+. The spot then used digital matte painting and compositing in Nuke, with each shot being tracked, before the matte painting was projected onto each building to produce the 'wrapping' effect. Mill Producer Rachel Stones comments, "This was a really unique experience as well as a real labour of love for both myself and our Mill+ Creative Director Dan Williams. We worked alongside Neil Dawson and Clive Pickering (ECDs), direct to the Collect+ client. Our involvement therefore encompassed all aspects of the production from start to finish. It was unusual but the whole project relied on a mutual trust and respect between the small team and a client who was hands on throughout." Dan Williams, Mill+ Creative Director comments, "I'm very proud of the whole team who worked on this. Everyone involved over-delivered at each stage. Hopefully that warmth comes across in the spot. Neil and Clive had a very clear vision of how the film should come to life - they wanted it to have a relaxed pace in contrast to some of the more energetic ads on air and I feel that we hit that note perfectly. I look forward to the next one."